Wind World (India) Ltd. has three dedicated facilities for blade production, which produce 10 blades a day, and cater to the commissioning of 1000 wind energy converters per annum. 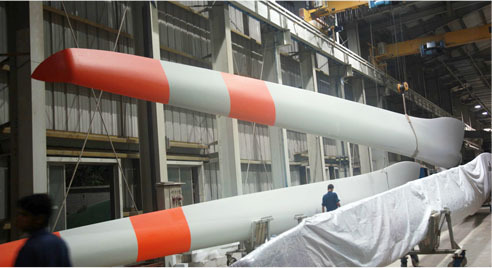 The facility is ISO 9001:2008, SGS shop approved, for production of rotor blades, on the basis of GL rules and guidelines. The foundation of blade manufacturing is based on a competent team of people, time tested latest equipment and high quality raw material, received from reputed vendors. Blade production is managed systematically using an advanced tool like Six Sigma. Going by our track record of producing high quality blades, right from 1994, we have not had any issue in the field because of blade failure. A very unique aerodynamic profile - equipped with an additional part spoiler. Coefficient of power being extracted up to 0.5. Protection - by a time-tested lightening protection system. Snout shape aluminium tip design, to reduce noise and air turbulence, and increase generation output. Superb surface smoothness - avoids fungus and algae formation, and draws maximum air velocity. Weather-proof PU paint system - resists paint erosion. Hollow axial aerodynamic composite blade design - for high strength to weight ratio. Periodic checks & maintenance done on mould - for reliable aerodynamic profile of the blade. since they have been installed, till date. Highly precise VARIM process and auto power hinge mechanism for mold closing reduces human error and ensures consistent quality. Auto dust extraction and de-burring system - minimizes dust PPM level inside the plant. The entire product process is monitored online using an eco-graph. Sophisticated paint booth - for rotor blade surface spraying. Excellent plant lay out - for efficient production. Online software - for product protocol database. Online video inspection carried out for reducing defects. Highly qualified, well trained and experienced team of engineers & technicians - for in-house capability to manufacture composite rotor blade plugs, molds and product manufacturing. Safe and healthy work culture.